: Korean Cookery. a spicy fermented mixture containing cabbage, onions, and sometimes fish, variously seasons, as with garlic, horseradish, red peppers, and ginger. Why add it to your meals? Kimchi is full of beneficial microbes for your gut health. Microbes help us digest and clear out toxins (boosting immunity). There are some studies that also show when eating meat with kimchi, less inflammatory markers are present. 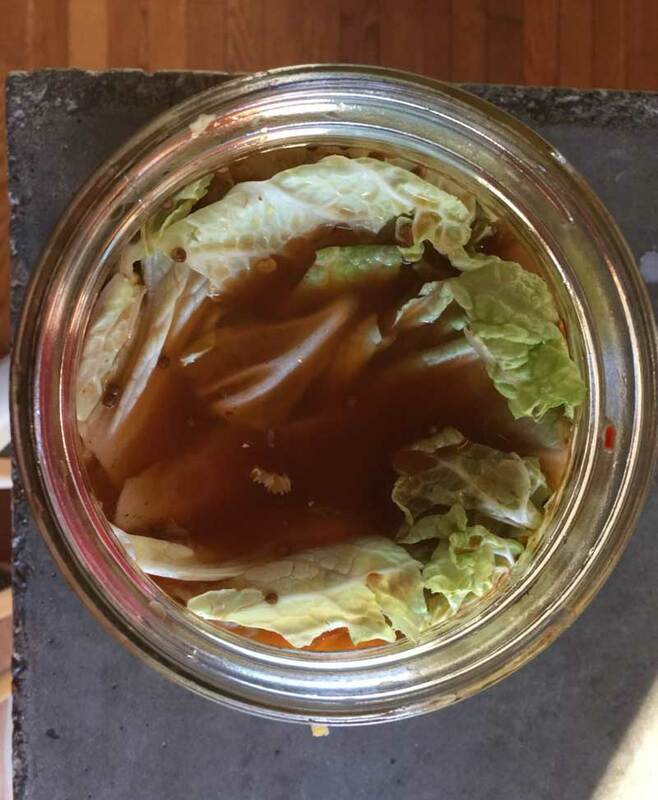 Most Americans don’t have all of the microbes we should in our GI tract, therefore adding 2 T of Kimchi to your meal will help you digest your food and send lots of lactobacilli bacteria (GOOD) to your inner eco-system. Kimchi is high in Vitamin C + A. It can also produce amino acids, absorb minerals, and eliminate toxins. So what are we waiting for? There are over 300 different recipes for Kimchi and not any two taste exactly the same due to the fermentation process. You can intuitively make one your own with different herbs, seasonal vegetables and spices. The two ingredients I chose to start with are Cabbage + Daikon Radish. Start slicing your cabbage and any other vegetables you choose. I recommend going to the farmers’ market to scope out what’s available. You’ll need a bigger pot to massage all of your ingredients. Sprinkle a good quality sea salt (without anti-caking agents) + organic red pepper flakes over your ingredients and let sit for a couple minutes. You’ll notice that your cabbage will start sweating. It’s time! Connect your hands to your ingredients and start massaging for at least 5 minutes. The juices will build up and when you intuitively feel it is enough, pour everything into mason jars, a large glass jar or a fermenting crock. Make sure liquid is covering the ingredients. When you are ready to cover, you can place a larger cabbage leaf on the top to help keep fluids covering ingredients. With your hands, push ingredients down into the jar to release as much oxygen as possible. You may need a weight to hold the ingredients down. Leave for 3 – 5 days, burping each day (opening the jar) or until taste is desired.